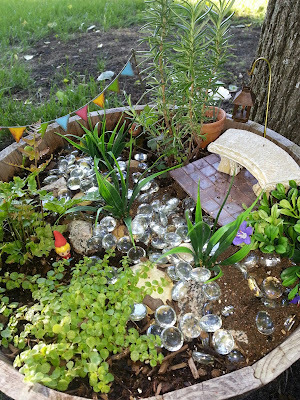 Women on a Mission: Mom Edition: UPDATE: Easy Mac's Fairy Garden Finished! Hey everyone, remember a few weeks back when I revealed this year's fairy gardens? Click here. Well, Easy Mac's wasn't quite finished, but it is now, with the pink tile patio (scrapbooking tiles from the clearance section at JoAnn, glued onto screen from a sliding door), a new bench (couldn't find hers) and a pot with silk flowers hot-glued into the bottom and then filled with dirt (it's got a hole in the bottom of the wee pot to drain like any regular pot). You can see the little Squinkie gnome I made in there too. So darling. The two plants on the left are real, as is the rosemary 'tree' on the top right. The 'river plants' down the center and the 'shrub' on the bottom right are silk. Shaun made the shepherd's hook to hold the lantern over the patio out of a wire hanger.